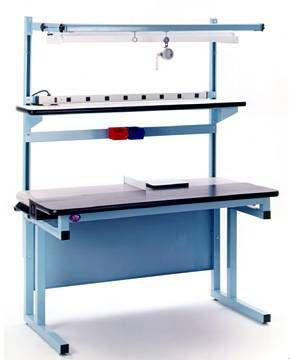 Variable speed belt conveyor built into our popular cantilever CHD workbench. Works great with progressive assembly applications. UHMW (Ultra High Molecular Weight) work surface makes it easy to slide product on and off conveyor. Belts come in both standard and ESD polypropylene. Just pop in place, side by side and plug in! NOTE: The illustration includes "In Stock" Optional Accessories #1, 2, 3, 4, 7, 8, and 17. More items are present in our Newest Catalog . Get your copy today. Use our interactive Build-A-Bench app to get a quote now.